Description: Euphorbia pugniformis is a medusaform Euphorbia, a thornless small succulent that in its normal form has two to three rows of lateral shoots around the deepen tip of a swollen succulent base. Each tubercle bears one lanceolate, caducous, green leaflet up to 4-8 mm long. The species has two cristate forms; one with a cristate central shoot and normal lateral shoots developed on it, and another with cristate lateral shoots only, without main shoot. while in shadow it is bright green. Euphorbia pugniformis fa. 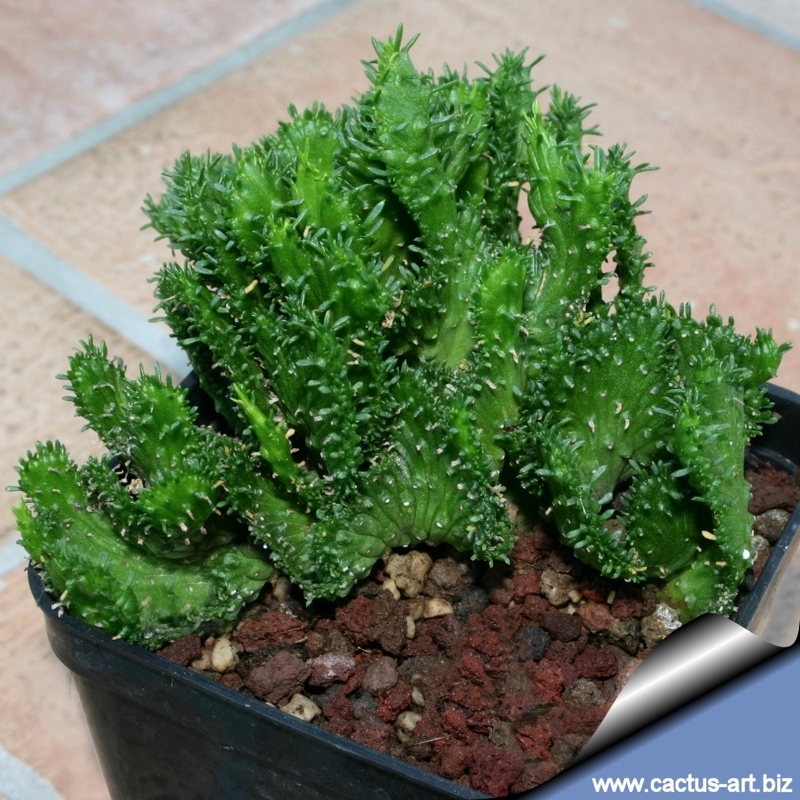 cristata looks almost identical to Euphorbia flanaganii fa. 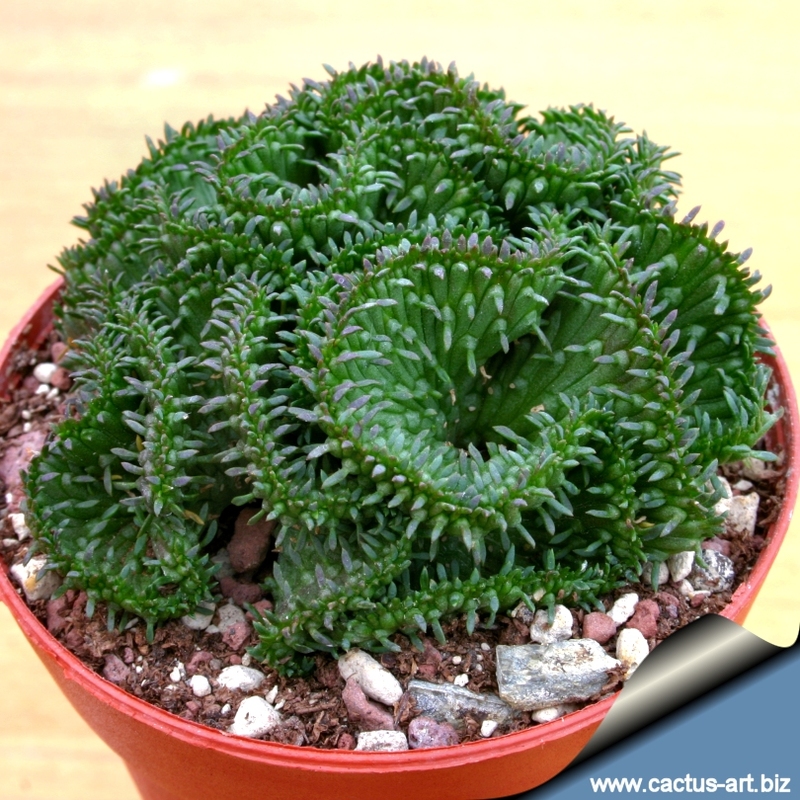 Cristata and a correct identification is often difficult. 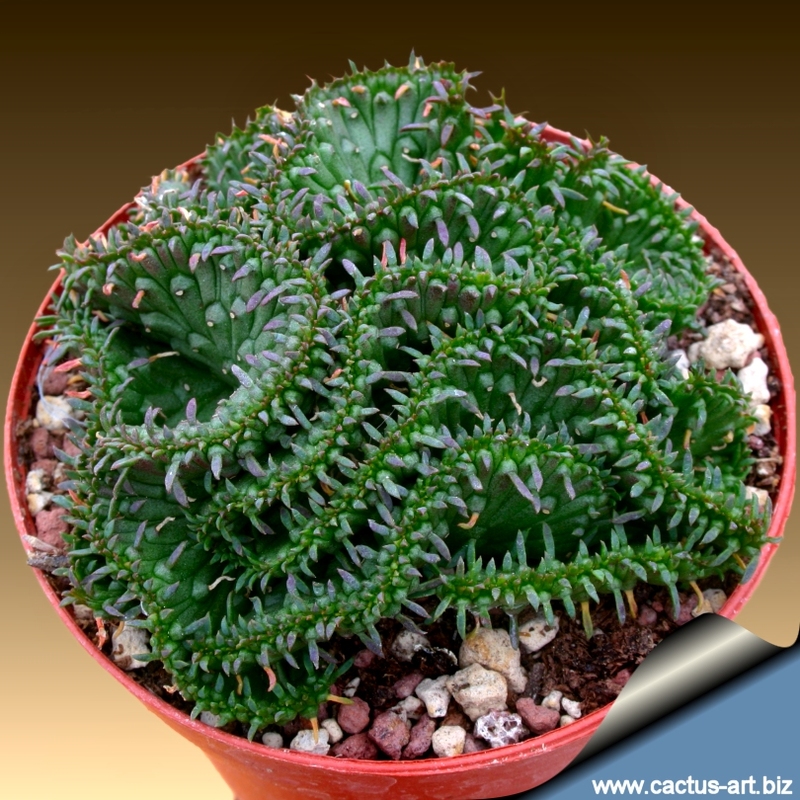 Cultivation: This is a relatively fast growing species, It like a sunny position and does best in a mineral soil, but is tolerant of a wide range of soil types. Good drainage is essential. Water sparingly during the summer months and keep quite dry in winter. It can tolerate moderate shade, and a plant that has been growing in shade should be slowly hardened off before placing it in full sun as the plant will be severely scorched if moved too suddenly from shade into sun. Propagation: As the cristate forms do not flower, the method employed for its propagation is by cuttings. Note: As with all other Euphorbias when a plant get damaged it exudes a thick white milky sap known as latex. The latex is a violent emetic and purgative and is used by natives for the purpose of curing indigestion and constipation. The sap is highly irritant, however. A case of death from drinking a concoction of the plant is on record. A yellow resinous substance in this plant called Euphorbin can cause terrible blistering of the skin. 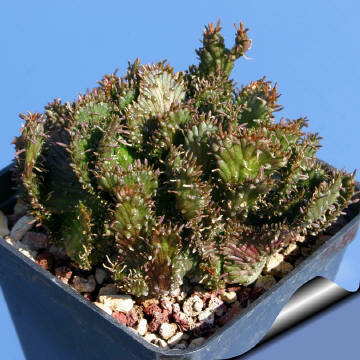 Photo of conspecific taxa, varieties, forms and cultivars of Euphorbia pugniformis.